This is a complementary pet food for adult dogs aged 6 months+. Proper food for dogs. Expert dental care. Natural ingredients. Developed with our vet dentist. Vet approved recipe. Plaque removal. Fresh breath. Clean teeth. Spongey texture reaches gumline. Parsley & fennel for fresh breath. Irresistible delicious taste. Full of natural ingredients. Certified B corporation. The Queen's Awards for Enterprise: Innovation 2016. Ethical Award - The ethical company organisation. Woofbrush is a dental chew with a difference. Thanks to its clever spongey texture, this chew gets right down to the gumline to wipe away plaque - and it's all thanks to natural ingredients. We believe all pets deserve proper food, and that's still true when it comes to dental chews. Because dogs eat their 'toothbrush and toothpaste' (their dental chew), it's important that their chew is as kind to their tummy as it is to their teeth. Woofbrush has been carefully crafted with help from our pet dental expert to make sure it works brilliantly, and uses top notch natural like parsley, coconut oil and fennel for a proper clean without the added nonsense. What's more, dogs absolutely adore the taste. From extensive feeding trials to the reactions of the office dogs whenever someone opens a packet, we know the Woofbrush is a chew that's a treat not a chore. We recommend brushing teeth daily but if this is not an option a Woofbrush a day is a good alternative and will help support your dog's dental health. 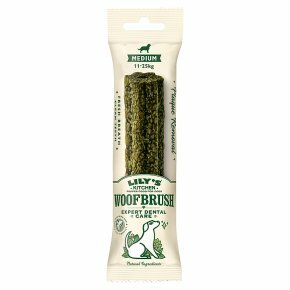 This dental chew is just about right for medium sized dogs, and for popping in your bag if you're out and about. Feeding Guidelines: Feed 1 chew a day to help keep your dog's teeth clean and healthy. Serve at room temperature on a non-stainable surface. Make sure your dog always has a bowl of fresh water available when feeding. When feeding any chew, reduce your dog's food intake to avoid weight gain. Always choose the right size chew for your dog and supervise them when eating as chews can be a choking hazard, particularly when there's only a small bit left. These chews will differ slightly in size, shape and colour from pack to pack. Once opened, feed straight away.